in water as well as on or in a body by applying mild electronic pulses. 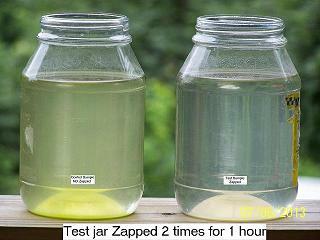 The cloudiness and color of the control jar on the right shows that there are still living microbes in it. provide the best quality and the best performance available. for the best information about zappers and zapping, regardless of which zapper you use. It contains information on how to get the best rsults from zapping and more importantly, what not to do. Learn more about zapping and zappers for \$9.95 plus postage. why would we not be able to kill a smaller organism with a little electricity? According to Dr. Hulda Clark, the zapper or parasite zapper can and has provided relief from allergies, asthma, arthritis, food allergy, hard to cure illness, cancer, IBS/Crohn's disease, colitis, colds, influenza, diarrhea, or other infections caused by parasites such as protozoa, giardia, candida, cryptosporidium, chlamydia, colon parasites and intestinal parasites in humans. Unfortunately, the FDA does not allow zappers to be sold for these purposes, so we have moved our zappers to www.petzapper.com. Yes, Stabilized output is available on all ParaZapper™ models. Ruggedly built for long lasting reliability and durability. We sell to individuals and dealers as well as many professionals around the world. 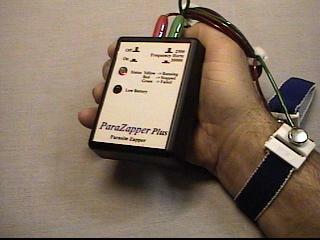 The ParaZapper™ parasite zapper is popular, because it is easy to use, rugged, reliable, and inexpensive. Satisfaction guaranteed 3 year parts and labor Warranty. Please Note: Wrist straps are not recommended and this picture is only to illustrate the original usage of the zapper. The original purpose of the Dr. Hulda Clark parasite Zapper was to fight cancer by eliminating the parasites that cause cancer. Parasite zappers have been shown to have new additional uses such as killing microbes in water. Microbes are known in some cases to cause allergy and allergies, asthma, arthritis, IBS, colitis, chronic fatigue, fibromyalgia, chron's disease, athletes foot, and infections caused by parasites such as protozoa such as giardia and cryptosporidium, bacteria, fungi, yeast, worms such as flukes, hookworms, ascaris, and other parasites.